It’s deeper than you might expect. 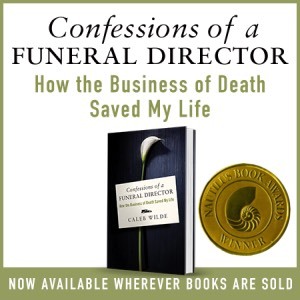 One of the things that I’ve feared in the release of my book is that “book writing Caleb” wouldn’t be as accepted as “blog writing Caleb.” Many of you have come to this blog over the years for a dose of light-heartedness, funeral industry talk and — every now and again — some deeper, more thoughtful posts. While I retained those facets in writing a book, this book highlights some of my deeper thoughts set to my story in death care. Bloggers aren’t always the deepest of folk. Bloggers write about cats, and food, and gaming, and if a manual breast pump is better than an electric breast pump for the working mother. While all those things are important (what’s more important than cats? ), I’ve always gravitated to gravitas. The margins will be used. I’ve had a number of people tell me they’ve read it a couple times BECAUSE THEY LIKE TO TORTURE THEMSELVES WITH MY BAD WRITING. No, actually despite my bad writing, I’m hoping that this book can become a companion to those who are journeying through death, dying and coming to terms with their mortality. It doesn’t come with a funeral coupon. Sorry. Maybe my next book will? It’s comfortable in a number of spaces. Our dead exist in liminality, the in-between where they are dead and living. We like binaries, the either/or of yes or no, absent or present, on or off. But out dead can both be absent and present, they are quiet and they still speak, they are both dead and live on through us. Any book that’s written about death shouldn’t be written with easy yes or no answers about grief, death and dying. And I think this book is comfortable in different spaces. Since it’s release, it’s been featured on Vice and Country Living, ETWN (a Catholic TV station) and The Cut (a progressive news organization that offers stark contrasts to Catholic beliefs). It’s written for individuals and it has a group discussion section. The book ends with a birth. My wife and I can’t have kids on our own. As hard as it is to realize you can’t conceive children, infertility does allow for something: it allows you to question how much you really want children. One of the only options for people like us is adoption. And the process of adoption allowed me to pause, it allowed me to ask — really ask — if I could be a dad. 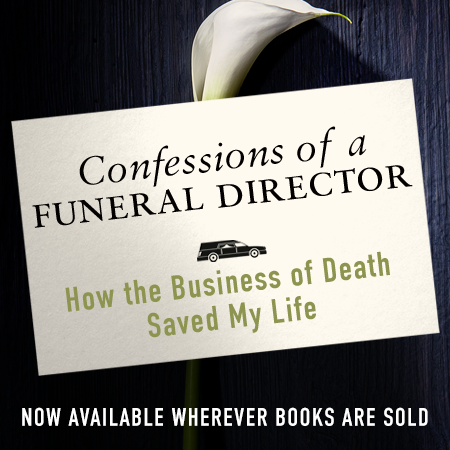 For me as a funeral director who saw too much tragedy as a young man, the process of being able to say, “Yes. I’m ready to be a dad” was only possible because I reframed death. This book is essentially the story how I become comfortable enough with death and the tragedy in the world to believe that I could not only father a child, but that the world is good enough for children. 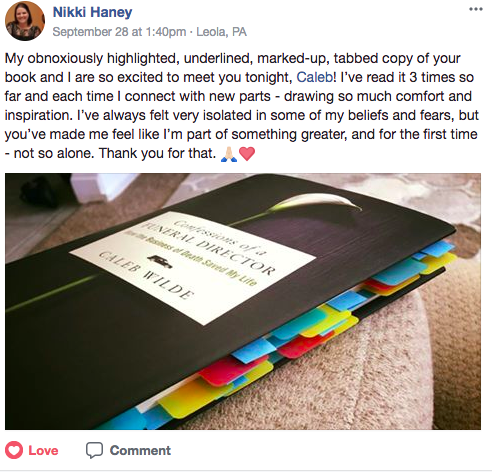 If you’ve followed by blog, you know Caleb-the-blogger, but I’m hoping that Caleb-the-book-writer can find a space in your life as well. This entry was posted by Caleb Wilde on October 18, 2017 at 9:38 am, and is filed under Book. Follow any responses to this post through RSS 2.0.You can leave a response or trackback from your own site.